Next to a small wooden house in this town just east of Kampala, 10-year-old Solomon Walusimbi plucks pea pods from a lush green tangle of creepers. "This is my garden,” he says. “I plant so many things, like peas, carrots and maize." Rows of cabbages wind beneath passion fruit vines, and tiny red eggplants rub shoulders with the spikes of a rare type of leek. If it looks more colorful than an ordinary farm, Solomon says, this is because he understands the importance of diversity. He explains that "if you dig, this one will die and this one will continue growing, and you will continue eating and getting so many things." This is a lesson Edie Mukiibi is working hard to spread among his fellow Ugandans. As the new vice president of Slow Food International, his mission is to create 10,000 gardens like Solomon's throughout Africa – many in schools – instilling in the next generation the movement’s ideals such as biodiversity, food activism and the preservation of local food traditions. 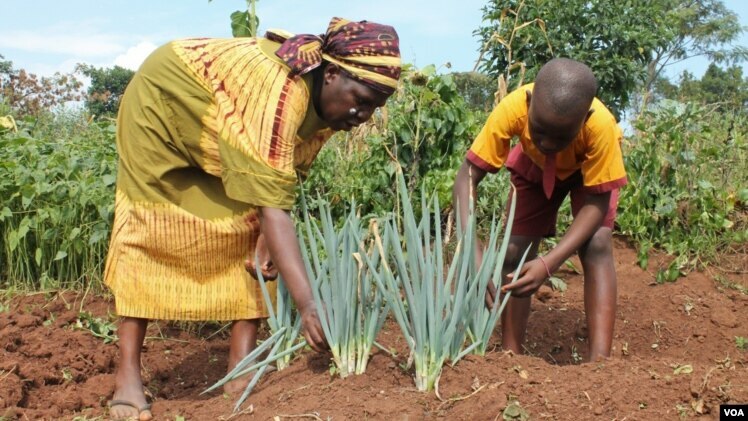 "You find little children of 3 to 15 years having a lot of knowledge about the traditional crops, the local crops, the planting seasons and such kind of things, Mukiibi says. “This is what we are achieving with the gardens. The gardens project is very important to reconnect young people like Solomon back to the land." Seven years ago, as an agronomy student, Mukiibi was taught to encourage farmers to plant hybrid crops that, he found, were ill-equipped to handle Uganda's unpredictable seasons. This is when he realized how important local foods were to food security, he says, and how quickly they were disappearing. "These are products which are used to the African conditions, apart from being traditional,” he says. “When we had a bad season and farmers predicted a bad season, they had a crop for that season. When they predicted an attack of butterflies and insects, they had a potato variety which was resistant to this pest, and everyone was encouraged to plant that. Today, we have no choice." Slow Food's gardeners are encouraged to grow traditional crops that are slowly dying out as the continent's food becomes more and more homogenized. But the movement, promoted in the West by celebrity chefs, is fighting an uphill battle in Africa. Here, says Mukiibi, politicians and scientists tend to focus their efforts on developing high-yield varieties of seeds and encouraging big agribusinesses to invest. This, he argues, is not the best way to combat hunger.